Absolutely Corporate Blog have you considered a corporate wellbeing program? With the recent running of the City 2 Surf and R U OK? Day still approaching in September, now is a great time to consider your business’s Corporate Wellbeing Program, or if you don’t have one, the benefits that one can provide. In fact studies have shown that the return on investment for a targeted, efficient and well run corporate wellbeing program can be between two and five-fold. 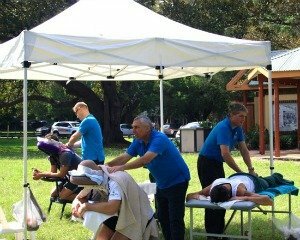 Absolutely Corporate can help you provide one-off event based wellbeing services, such as our event massage, which is ideal for the City 2 Surf, or for your corporate event, while our corporate golf day massage is a great accompaniment for taking staff or clients to the golf course. R U OK? Day is also a great catalyst for considering our Workplace Stress Management courses, which run over six weeks and can help your staff master techniques and strategies for reducing or managing stress and a number of other stimuli at work. Alternatively you can always add one of our corporate seated massage programs to your workplace, offering flexible massages to your staff, either in a dedicated space we can set up specifically, or even at their desk or workstation, ensuring minimal disruption or workflow, while still providing all the benefits of massage. We can help you build the perfect corporate wellbeing program for your workplace, with plenty of flexibility and designed to suit your specific needs. Contact us today with your requirements, any questions you may have and the goals you’d like to achieve and we’ll outline the solutions we can provide to reach them. Our programs can be tailored to your preferred frequency and budget, and we have activities and programs to address a broad range of health and wellbeing areas. You can even start with a Workplace Health Assessment so your staff can receive a constructive snapshot of their health, and go from there. You can contact us on Facebook or via the Contact Us page, to find out more or to organise your own Stress Management Workshop, or any of our other workplace wellbeing services.